Blue tags are 1000 year old fish weir stakes beneath a dairy pasture. Source: Byram pdf @ WARP website. With estuarine sedimentation and, perhaps, tectonic adjustments, it is expected that some intertidal areas become near-shore land. Such a process is happening at such places as the leading edge of the Fraser River delta, for example. In the above picture, sedimentation has buried a fish weir, which is now found shallowly buried under a cow pasture. Another weird weir is the one above found under a concrete bridge in sediments that appeared at first glance to be heavily disturbed. Apparently not! A good cautionary tale for assessing site potential and significance. 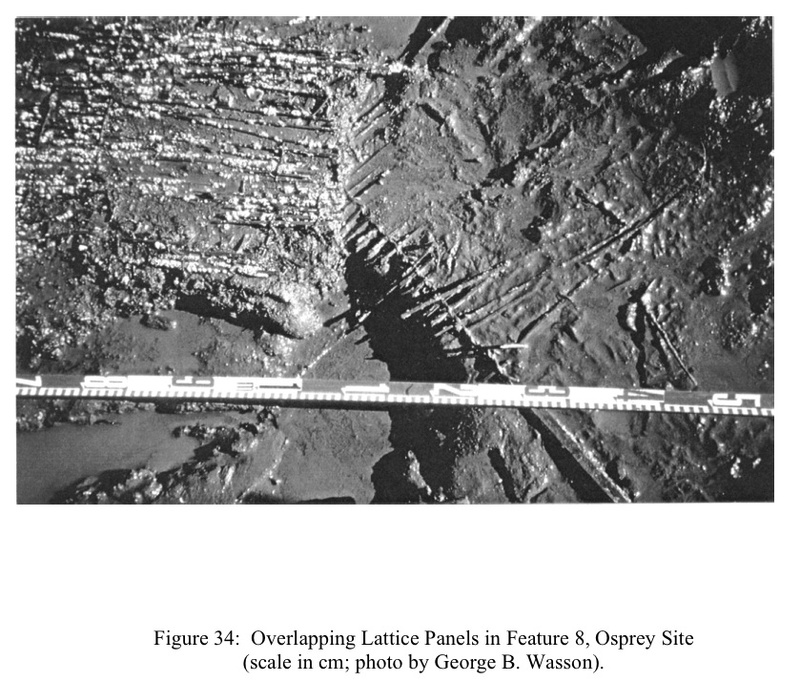 Anyway, if this doesn’t whet your appetite for some Oregon fish traps, then feast your eyes on the preserved latticework below, a small sample of the interesting findings and complete reportage found in Scott Byram‘s Ph.D. thesis “Brush Fences and Basket Traps: The Archaeology and Ethnohistory of Tidewater Weir Fishing on the Oregon Coast” which you can download here (click on the “download the paper” link, no direct linkage to PDF possible). Remnants of stationary fishing structures on the Northwest Coast of North America are commonly investigated by archaeologists, with most studies focusing on questions of function and chronology. Here it is argued that in Native Northwest Coast ontologies fish and fishing structures were considered animate and part of the social worlds within which humans and fish were engaged. Fish were considered capable of retaliating against those who treated them improperly, and one way of ensuring that no offence would occur was to dismantle fish traps when they were not in use. Using recently documented archaeological fishing structures on Willapa Bay, Washington, USA, as examples, it is argued that these and many other Northwest Coast archaeological fish traps were partially dismantled in the past. I haven’t fully digested this paper, but it is part of a very small and yet, I think, very promising trend in archaeology to take seriously, literally if you like, indigenous world views and spiritual beliefs as a key to unlocking otherwise inexplicable aspects of the archaeological record. Fish weirs, with their fine-grained temporality (that is, each stake is potentially dateable, meaning the process of maintenance and repair can be closely tracked, sometimes over centuries) offer an incredible resource for understanding deep cultural structures and environmental management strategies, at a nonetheless human scale. It’s an inspiring paper, as is the work in Oregon, in Comox, and elsewhere on the coast where weirs and traps are finally getting the attention they have long deserved. Preserved wooden lattice-work panels. Source: Byram Ph.D. Figure 34. This entry was posted in Archaeology, Northwest Coast, Oregon, Technology, underwater archaeology and tagged fish, fish traps, fish weirs, fishing, Oregon. Bookmark the permalink. Today’s posting on fish weirs in Oregon reminded me of a question I have had ever since I heard of a site in Kennedy Lake (between Ucluelet and Tofino BC ). I have asked around (see below) about this. Are there any other similar structures known in the Pacific NW? My question was to Alan McMillan a year or so ago regarding a site in lower Kennedy Lake. The lower Kennedy River flows into Tofino Inlet (Clayoquot Sound). Kennedy Lake is historically known for its Sockeye Salmon runs. Sockeye spawn(ed?) along many of the lake’s beaches and in deep water at the inflow of the Clayoquot River at the north end of Clayoquot Arm. There is a stone structure located in Kennedy Lake above the outflow into the Lower Kennedy River. It consists of a massive arched ‘weir’ , made of boulders, that stretches from the mouth of Staghorn Creek on the west side of the lake to the opposite east shore. Barry Campbell (Parks Canada Ret.) photographed it from the air maybe 20 years ago. A short article, with photo, was published by him in an archaeological journal (BC Archaeologist?). Are you familiar with this site? I’m only familiar with it through Barry’s photograph. It was published with a very short description in The Midden (Publication of the Archaeological Society of B.C.). I managed to locate it in a quick search. It’s in Vol. 26, No. 3, 1994. I don’t know of any further studies on this. Jur Bekker asked “Are there any other similar structures known in the Pacific NW?”. I think there are a couple of answers to this question. Yes, there are lots of similar structures in form and manufacture in the NWC – for instance I have seen quite a few small ones on Meares Island creeks not that far away, as well as in other places such as Haida Gwaii. Some of them have wood stake remains in the rock wall. I have even seen one in use at Klukshu in the SW Yukon on a tributary of the Tatshenshini River – it has the wooden structure intact and maintained with the base of the trap supported with rock walls. But, the Kennedy River trap is very large and in that respect is probably atypical of NWC fish traps. Its association with a lake is not unexpected, but it is not often that a large salmon lake is so close to the marine setting and thus the conditions that may have led to this trap might not prevail in many places as longer rivers might have numerous good places for other kinds of traps or fishing methods. I am pretty sure others exist of this size and form, but have not seen them myself. Thanks for answering, APM. I think I have seen the Kennedy Lake one — is it sometimes fully underwater, but visible, near the bridge? Anyway, I’m not sure I know of another one that is so closely associated with a lake, so that is unusual to my mind. But as you note, Kennedy Lake is an unusual lake in some respects. Other readers, please chip in. Great photo – if all lake spawning was like that, no traps would be needed. Just wade in and pick up the fish. Its recorded as DgSj-6 and it is near the bridge, within the lake and I think usually covered by water. Barry did a nice job mapping it over his aerial photos taken at lower water levels. There is a a big curving wall that connects (intermittently) both corners of the small bay next to the bridge and some other features such as a wall at right angles to the trap and parallel to the flow of the water that is further into the lake. That one is just visible on google earth if you squint hard enough and know exactly where to look. Would be nice to see a low water google image. In the 14 years that I have lived here, I have not seen the rock weir at the outflow of Kennedy lake above water. The closest to the surface I have seen the highest rocks may have been <2'below the surface. That would have been at the end of summer when the lake level is usually at its lowest. A local party did a cursory (no permit) survey from a boat at low water a few years ago to look for organic material (like stakes) stuck in amongst the rocks of the weir. They did not find anything. Some of these rocks are huge. More than one person can carry. It would also be interesting to find out where these rocks came from. Does anyone have an electronic copy of the article from The Midden I mentioned in my earlier e-mail?